Since I didn’t post a recipe – or anything food related – on Wednesday, I’m back today with a something new for you. 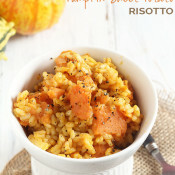 Unlike the trend I set for most of November, this is also NOT a dessert or snack recipe. 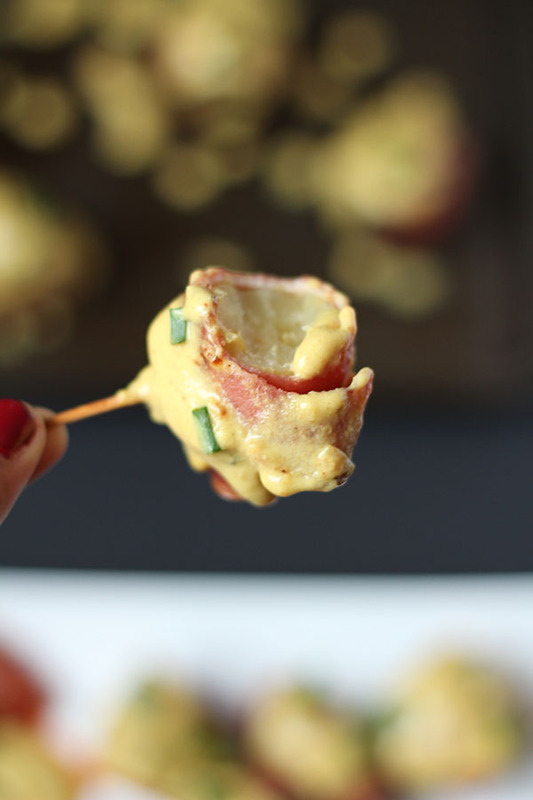 Yep, something savoury for ya: Dairy-Free Inside Out Loaded Potato Poppers. 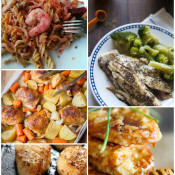 As I mentioned in my last post, it’s been a while since I had time to blog- and the same goes for cooking and baking. My soul has honestly been crying out for some uninterrupted baking time. In fact, those 30 minutes I spent in the kitchen last Tuesday perfecting the Gingerbread Spiced Roasted Nuts were probably the highlight of December for me so far. Back when I was a cheese eater, loaded potatoes were one of my favourite meals. I haven’t had one since before my elimination diet, so as soon as I saw these potatoes I knew that’s what I wanted to make. Butttt, these are itty bitty potatoes and I had visions of massacring them in an attempt to scoop out the insides. So, I decided to improvise. Instead of loading the insides of the potatoes with the usual loaded potato goodies- cheese, bacon and chives- I decided to load up the outside of my creamer potatoes. I started off by wrapping them in turkey bacon- using toothpicks to hold it together- then baking in the oven for about half an hour. They were pretty damn good on their own, but I’ve been meaning to make a dairy-free ‘cheese’ sauce for the last two months so I used 5 of those 30 minutes of oven time to whip one up. Yep. It was that easy. 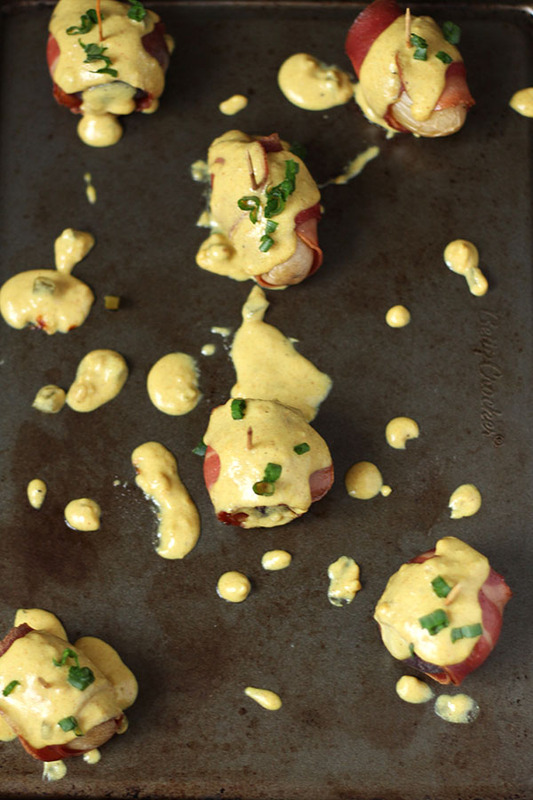 All in all, these diary-free inside out loaded potato poppers are crunchy on the outside, creamy on the inside with a little extra spiciness from the ‘cheese’ sauce topping. 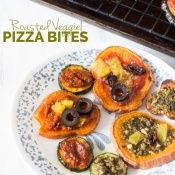 Plus, they’re easy to make, so they’re perfect for last minute dinners and potlucks. Seriously, I got these ready while my roommates showered after the gym last night and they swear it was the best post workout dinner ever. Mission accomplished. These Dairy-Free Inside Out Loaded Potatoes are crunchy on the outside, creamy on the inside with a little spiciness from the 'cheese' sauce topping. 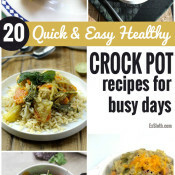 Perfect for last minute dinners and potlucks. 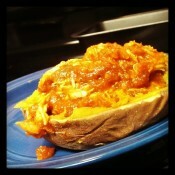 Follow GiselleR @ Diary of an ExSloth’s board :: Appetizers, Sides + Mains :: on Pinterest. What’s your favourite way to eat potatoes? Have you ever made your own dairy-free ‘cheese’ sauce? 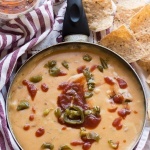 What’s your go to quick appetizer for potlucks or dinner? Disclaimer: I was provided with free samples of The Little Potato Company’s creamer potatoes, but, as always all opinions are my own. Love the cheese sauce! Nooch is like the best thing ever! 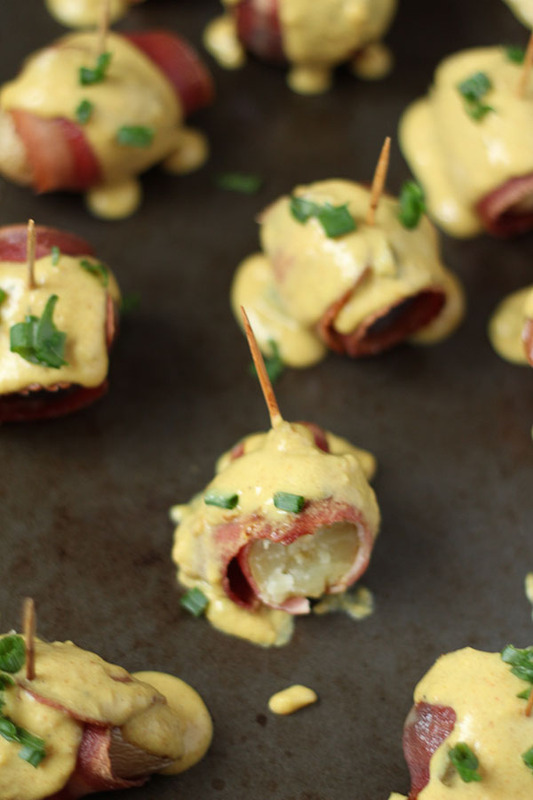 Potatoes hold a special place in my heart – and mini ones?! Too cute! I’ve never had those, though, and neither do I remember trying loaded potatoes before. Maybe because they’re not popular over here? ? 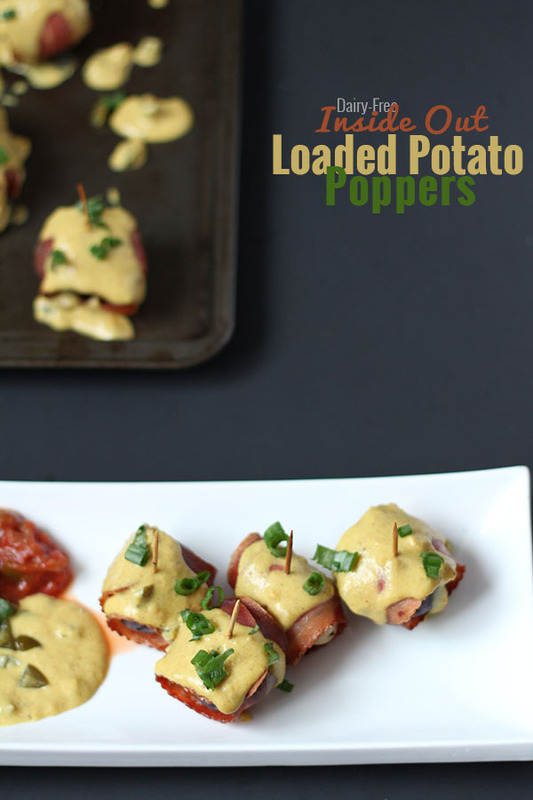 Either way, I don’t eat meat but your potato poppers still look great! 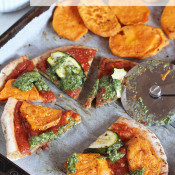 I make vegan cheese sauces all of the time so maybe I should attempt a vegan version of your recipe. p.s. loaded potatoes are a must. DO it!!! Now I know what I am making for our Christmas potluck! Rob’s family will dig in!